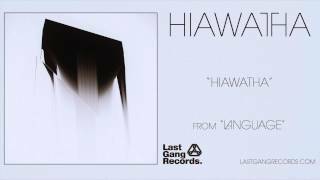 Last Gang Records is excited to announce the upcoming release of Language, the full-length offering from Hiawatha: a collaborative effort between Egyptrixx (David Psutka) and Thrush Hermit’s Ian McGettigan. The psychedelic-streaked project will feature a collection of new original compositions from the duo. Premiering this past weekend on Mary Anne Hobbs’ XFM show, listeners got a taste of what’s to come on the record with the ominous and psychedelic first single, “Caring Less And Less To See And Know You.” The album will be released on September 25, 2012 in North America, with the duo taking their live show on the road around the release.